A police officer dismissed over misconduct, has appeared before the Circuit Court in Accra with two bankers for allegedly defrauding a Chinese national to the tune of GHC 70,000. The former officer, Cyril Lumor Frank, was said to have claimed he could assist to discontinue Economic and Organized Crime Office investigations into the activities of the Chinese national, Jianhua Chen, and consequently got his accomplices to pose as EOCO officials. Prosecution told the court that Frank is a former Police officer of the Ghana Police Service who had been dismissed. Prosecution said the accused persons impersonated Charles Ofori an officer of EOCO to defraud Jianhua Chen, a Chinese in the sum of GHC 70,000. The prosecution said preliminary investigations revealed that the three accused persons presented to Jianhua Chen that they could assist to discontinue an investigation into her activities by EOCO. 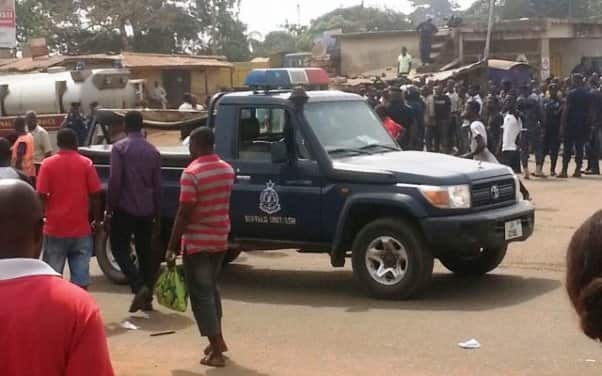 According to prosecution the three accused persons received GH¢65,000 earlier and shared it among themselves and that on February 6, 2019 Frank was picked up when he went to take the balance of GHC 5,000. The Court presided over by Mrs Jane Harriet Akweley Quaye reserved their plea for February 25 when they are expected to make their second appearance in court. In the meantime, they have been granted a aGHC 70,000 bail with two sureties each. The sureties must be gainfully-employed and must be earning not less than GHC 1,500. As part of their bail conditions, they are to report to the EOCO from Monday to Friday in the morning for interrogation.